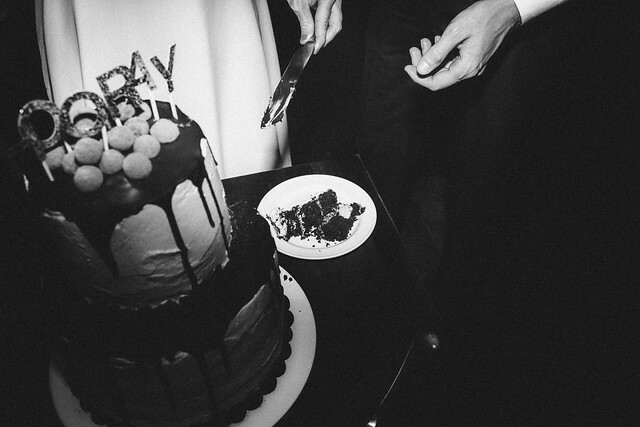 I never intended on doing something as crazy as making our wedding cake. But then one day, late March, I was so bored out of my mind that I decided to make a cake. 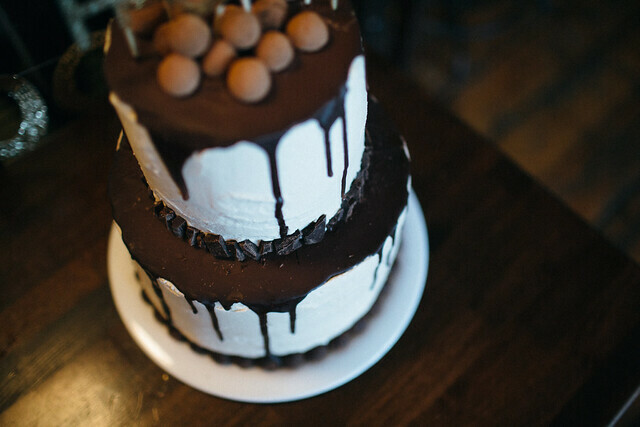 A boozy number that was comprised of chocolate stout layers smothered with Irish cream frosting and doused in whiskey ganache. And upon taking my first bite I thought: OH MAN. This would make for a delicious wedding cake. And upon taking my second bite I thought: I SHOULD TOTALLY MAKE OUR WEDDING CAKE. 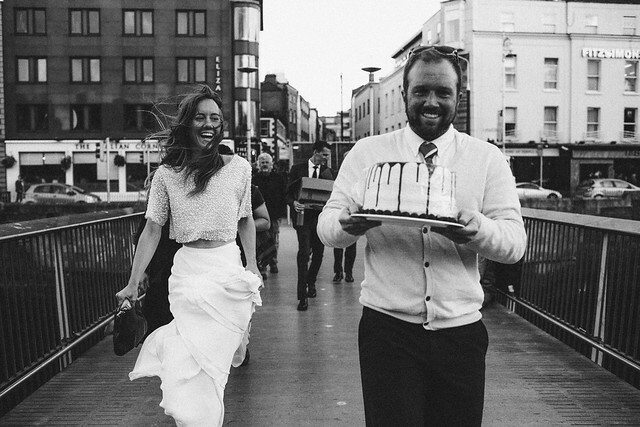 Those who know me know that I tend to be a chronic over-thinker, so I spent the better part of a week questioning whether making our wedding cake - in a foreign land - would be biting off more than I could chew considering I was also the one planning our wedding. At the end of the week (and two wedding cake trials and one cost-benefit analysis later), I came to the conclusion that I had nothing to lose. 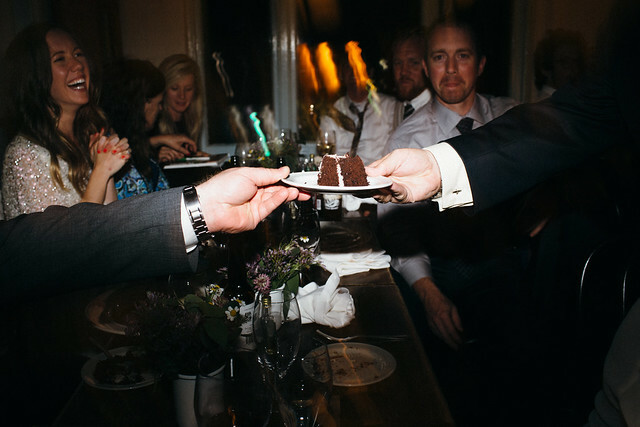 Our reception venue was providing dessert and if the cake didn't turn out, it wouldn't be that big of a deal. 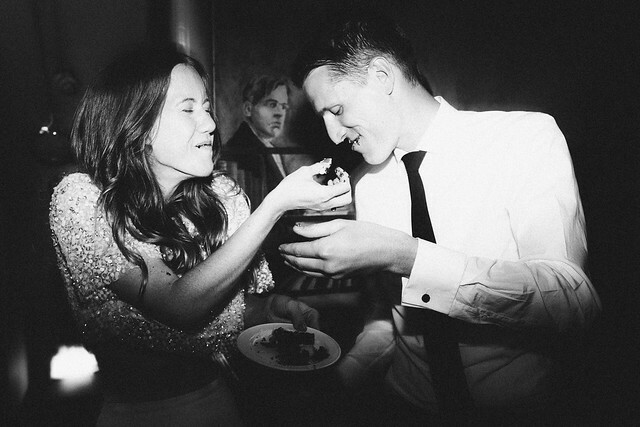 Except, two months removed from the whole thing, I'm pretty sure if our wedding cake hadn't turned out - after all the time and effort I put into it - I would have had a Kristen Wiig in Bridesmaids-level meltdown. Full disclosure: I was packing a WHOLE LOT of crazy in the days leading up to our wedding. 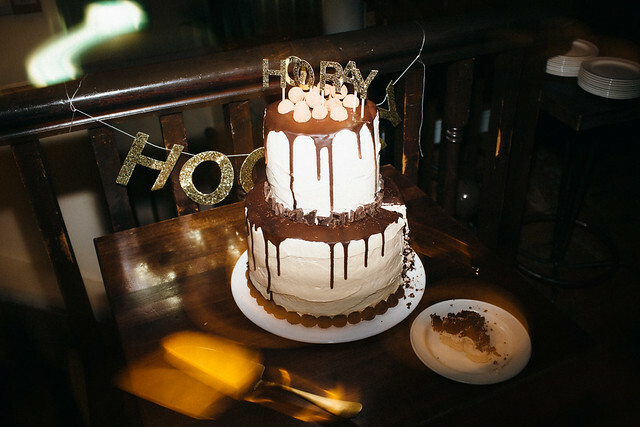 So after I made the overly ambitious (but extremely well thought out) decision to make our wedding cake, I compiled a list - a six page list - of all the things I needed, a step-by-step game plan, etc. - complete with a sketch of an oversized version of the end result. Then I started making my way through it. The first thing I needed? An apartment. With a decent size oven and at least a meter of counter space. 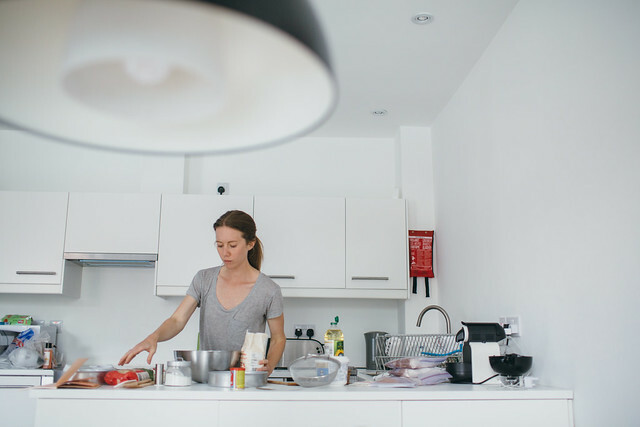 I hopped on Airbnb, found a perfect walk-up that checked all the boxes (oven, counter space, central location, etc. ), and didn't hesitate before requesting our dates. Within minutes, the host got back to me and had approved us for our stay. At that moment, the whole plan was starting to look more and more doable (and all I had was an apartment). I was really going to attempt to make wedding cake magic happen. After booking our apartment, I weighed the pros and cons of bringing everything in a suitcase vs. buying it all when we got into Dublin. Since I'm accustomed to working with certain brands (SUP Chicago Metallic, Fat Daddios, and Ateco), I decided to bring everything along so that there was one less outlier in the equation (but also so that I wouldn't have to worry about tracking down a baking supply store and spend a boatload of unnecessary money on things I already owned). 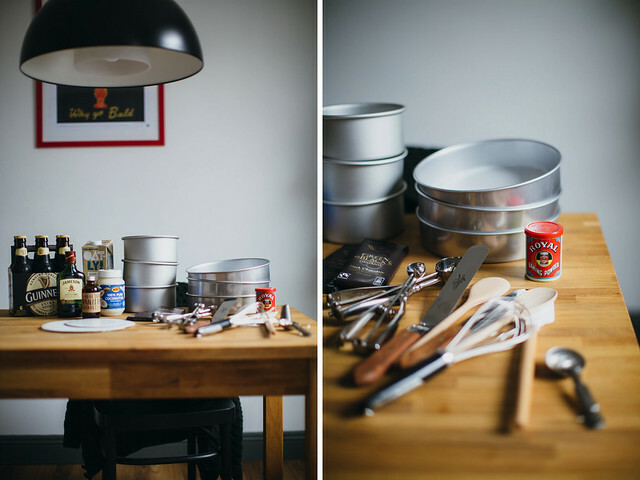 So I rounded up all the cake baking necessities in my kitchen (round pans, a frosting tip, various spatulas, etc.) and decided to order all the things I didn't have (a cake topper, parchment rounds, plastic dowel rods, etc.). Then, a week before we left, I had the bright idea to pre-mix all the dry ingredients (which made the baking process a total breeze). I also brought along my favorite non-hydrogenated shortening (mostly because it was about to expire and I had room in the extra suitcase) and a bottle of real deal vanilla extract because baking our wedding cake without my vanilla extract just seemed.. wrong. Actually making the cake was the easy part, because I already had everything planned out - all I had to do was follow a few recipes and stick to my somewhat rigid schedule, and I'd be golden. I reserved an afternoon for baking the layers, that night for making the truffles, then the following day (two days before our wedding) to do a majority of the assembly. 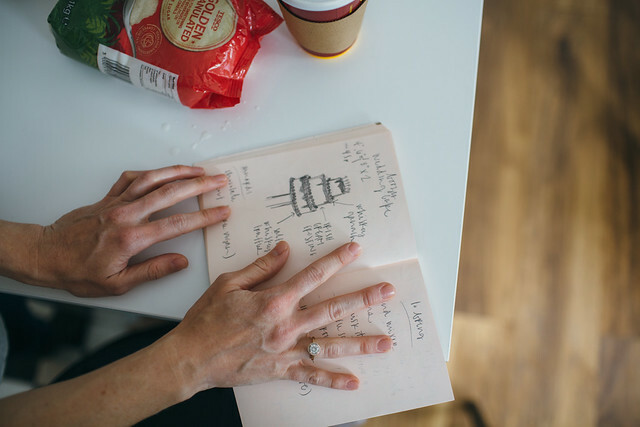 Having a schedule not only helped to keep me on track, but also allowed me to spend what little free time I had enjoying Dublin with some of our closest friends and family. And when I ran into trouble (like having difficulty finding a small bottle of whiskey or sourcing ingredients from an affordable natural food store), our host (HI JASON!) was quick to offer guidance. Just another benefit to booking a place via Airbnb - recommendations and helpful tips, straight from the locals. But then I was faced with an issue that even Jason couldn't help me solve, when I woke up the morning after my bachelorette party, head throbbing and still feeling a little woozy (read: probably too drunk to be putting the finishing touches on our wedding cake), but ready to tackle the poured ganache, assemble the truffles, and finish the damn thing. I started prepping all the ingredients and then realized, in the midst of bachelorette shennanigans, we polished off the whiskey I was reserving for the boozy ganache. Unfortunately you can't buy alcohol in Ireland before 10AM (believe me, I tried sweet talking the clerk at the convenience store down the street) (COME TO THE WINDING STAIR TOMORROW NIGHT AND I WILL FEED YOU ALLLLLL THE BOOZY CAKE), so I was, for lack of better words, pretty much screwed. Since we had to check out of the apartment by 11 (sadly it had already been booked for the weekend of our wedding), I transported the cake to my friends' Airbnb (90% of our guests booked their places via Airbnb, which I think is equal parts crazy and awesome) and finished running all the last minute errands in preparation for our big day. After finishing the errands, I decided to put the cake on hold a bit longer and meet up with friends for lunch, instead. On our walk back to the city center, we stopped by a flower shop that one of my ladyfriends spotted on the way to the cafe (good lookin' out, EJ! ), so we popped in to pick out stems for the reception arrangements and to see if we could convince the owner to throw together a last minute bouquet for the ceremony (we did and it was GORGEOUS). 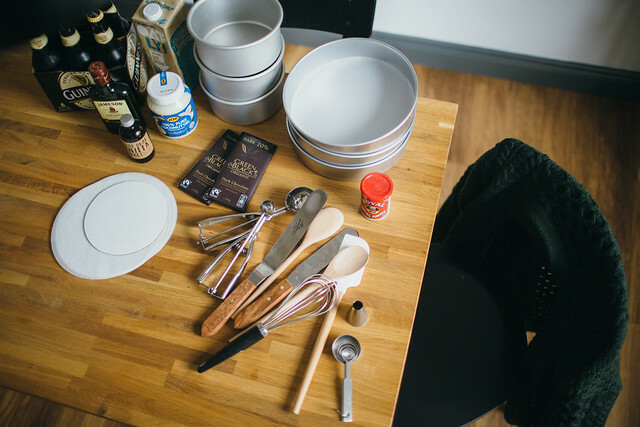 We went back to their apartment and I immediately headed to their crooked kitchen to get started on the boozy ganache, while they took it upon themselves to join forces and start piecing together the reception centerpieces. 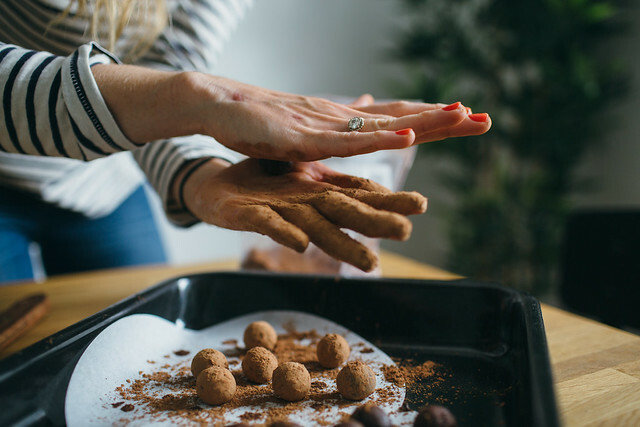 I remember standing over the bowl of ganache - whisking like a mad woman to incorporate the last little bits of chocolate - hearing them carrying on and laughing, and thinking to myself how cool it was that, a few days prior, these women hardly knew one another. And here they are, sharing an apartment and getting on like they've been friends for years. So the wedding ceremony came and went. And when it was finally time to transport the cake, our wedding day coordinator admitted that she was unsuccessful in convincing anyone at the restaurant to assume responsibility for the cake and schlep it over from the apartment (can't say I blame them but I did have a minor meltdown because HOW THE HECK AM I GOING TO TRANSPORT THIS CAKE?). 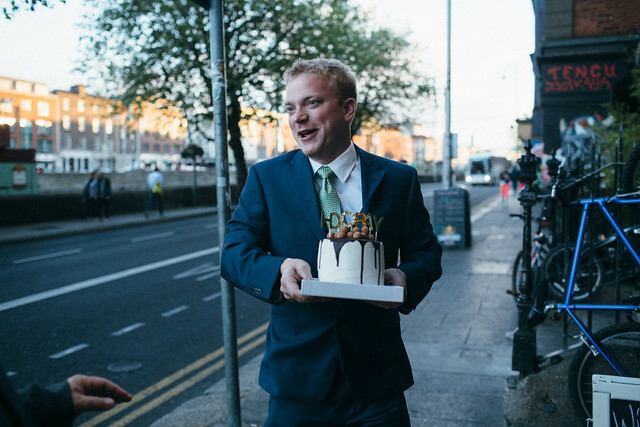 Thankfully it was less than a 10 minute walk from the restaurant, so we got a couple of extra sets of hands on board and I led the boozy cake parade through Temple Bar while Thom brought up the rear. When we finally got the cake to the venue - up two, winding flights of stairs - I realized I hadn't given much thought as to how I was actually going to assemble it. So without thinking, I grabbed the top tier with my hands (it had been chilling in the fridge so the frosting was somewhat firm) (although my fingers still did a bit damage), centered it over the bottom layer, chopped some chocolate using a butter knife that was provided with dinner then arranged it just so, and BAM! wedding cake complete. 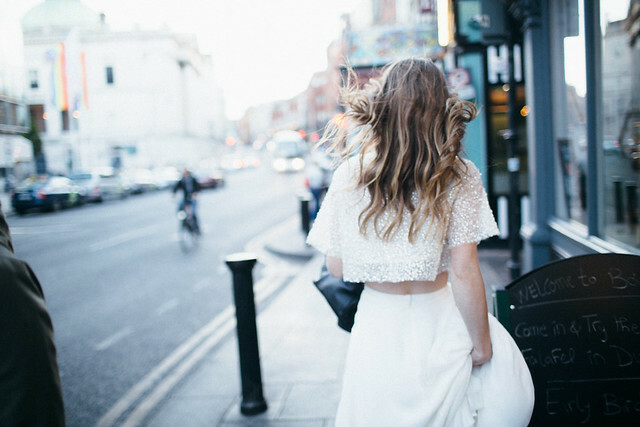 Just like that, every ounce of wedding-related stress evaporated into thin air. And, suddenly, I felt like a total badass because I just finished making our wedding cake. A cake that I baked in a stranger's apartment. Using a convection oven. IN A FOREIGN COUNTRY. And then I shoved it in Thom's face. Notes: I tripled this recipe to come up with enough layers for the wedding cake. But if you're making this for a small group, it'll make three 6" layers or two 8-9" layers. Guinness extra stout is technically not vegan, but if you identify as a vegan and consume Oreos (that are made with sugar that's processed with animal bone char) (I called Nabisco HQ to verify), I'm going to go ahead and say it's totally ok for you to consume a cake that was made with beer that was filtered with isinglass - a byproduct of the fishing industry. If you want to use coconut oil, make sure the beer and non-dairy milk are at room temperature before you get started. Otherwise using cold ingredients with the coconut oil will cause it to harden and your cake will be ruined. And you'll probably cry. Or break things. 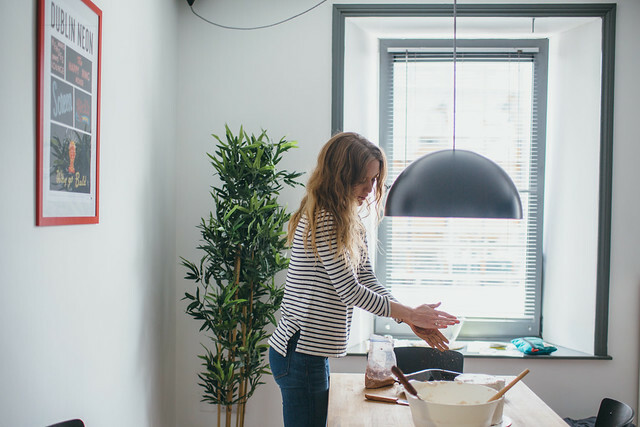 If you don't have cake flour, you can sift together 2 cups + 3 tablespoons (265g) unbleached flour and 5 tablespoons (55g) potato starch. This post is sponsored by Airbnb. All opinions are my own (and I think Airbnb rules). 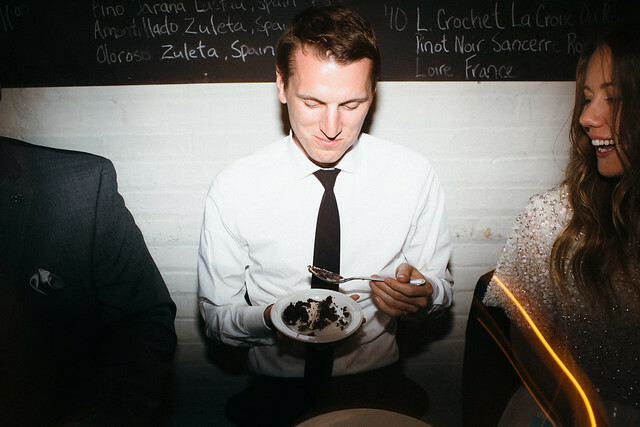 All photos were taken by our wickedly talented wedding photographer, Alison Vagnini. Preheat oven to 350˚F. 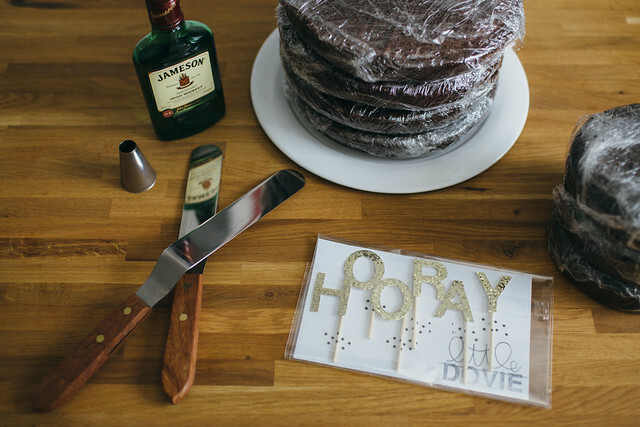 Line three 6" or two 8-9" round cake pans with parchment paper and spray with oil; set aside. In a small mixing bowl, sift together the flour, cocoa powder, baking powder, baking soda, and salt; whisk and set aside. In a large mixing bowl, stir together the sugar, oil, vanilla extract, and non-dairy milk. Add the flour and stout in halves, starting with the flour and ending with the stout. Whisk just until the dry ingredients have been incorporated and very few clumps remain. Do not over mix. Divide batter between cake pans (about 1 1/2 cups for three 6" cakes or 2 1/4 cups for two 8-9" cakes). Bake at 350˚F for 32-36 minutes, or until a toothpick comes out clean. Cover with towels and allow the layers to cool for 20 minutes (this helps them to trap the moisture), then invert the layers onto a wire rack to cool completely. 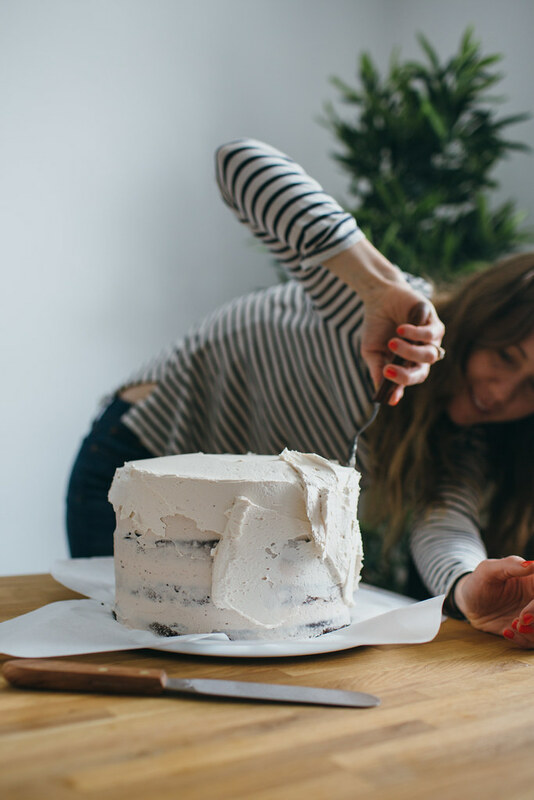 To make frosting the cakes easier, you should wrap them in plastic and let them chill in the refrigerator overnight (or triple wrapped and kept in the freezer for up to two weeks). Prepare the frosting by creaming the shortening on high speed for about 15-20 seconds. 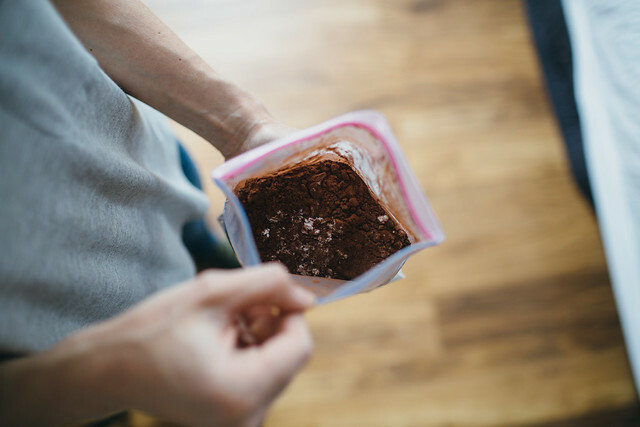 Sift in the powdered sugar, potato starch, cocoa powder, and espresso powder, then continue mixing, on high speed, for 25-30 seconds. While mixing, add the almond milk and whiskey and continue blending on high speed until light and fluffy. If the frosting is still a bit soft, sift in 1-2 tablespoons of additional potato starch (or more powdered sugar, but I’m not a fan of overly sweet frosting). If you'd prefer a lighter frosting, you can beat in additional non-dairy milk, one teaspoon at a time, until the desired consistency is achieved. 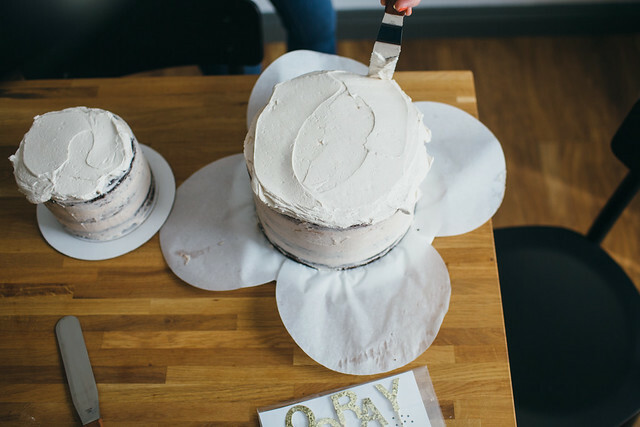 Once the cake is ready to be frosted, line a cake stand (or plate) with four pieces of parchment paper that overlap at the ends. 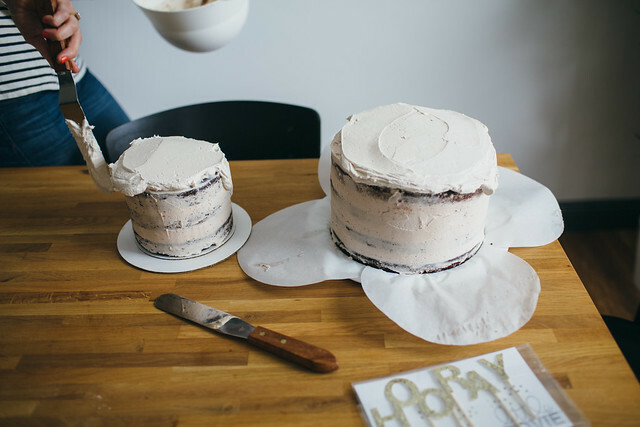 Remove the cake layers from the fridge (level if needed) and place one of the layers in the middle of the prepared cake stand. 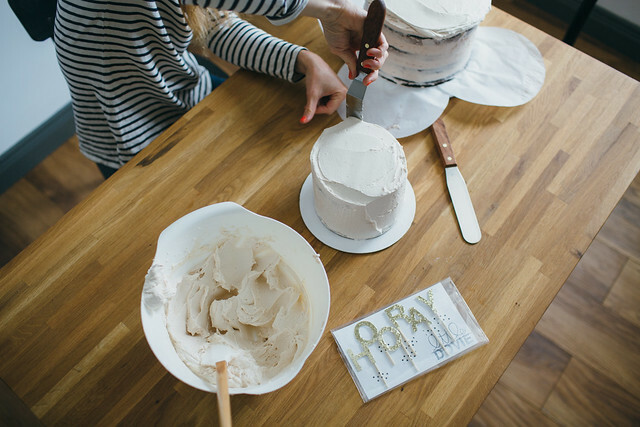 Pipe (or spread) a 1/4" thick layer of frosting on top of the first layer, then repeat with the remaining layers. 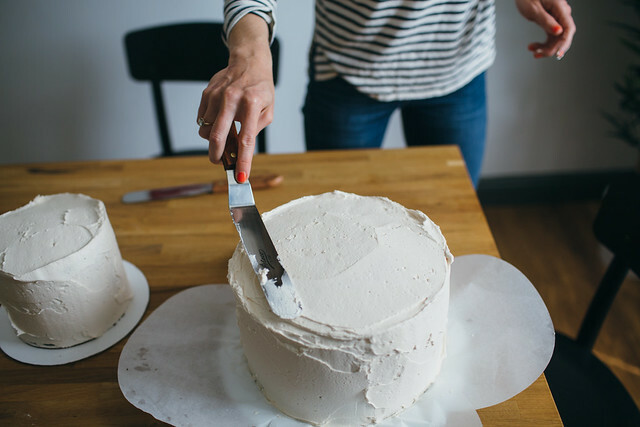 Using an offset spatula, smooth the frosting on the top layer around the entire cake, which will provide a crumb coat to make the frosting process a bit easier. Refrigerate the cake for 45 minutes. Once the crumb coat is firm, spread the remaining frosting onto the cake using an offset spatula (and a bit of patience). Don't worry about getting it perfectly smooth - the roughness adds a bit of character. 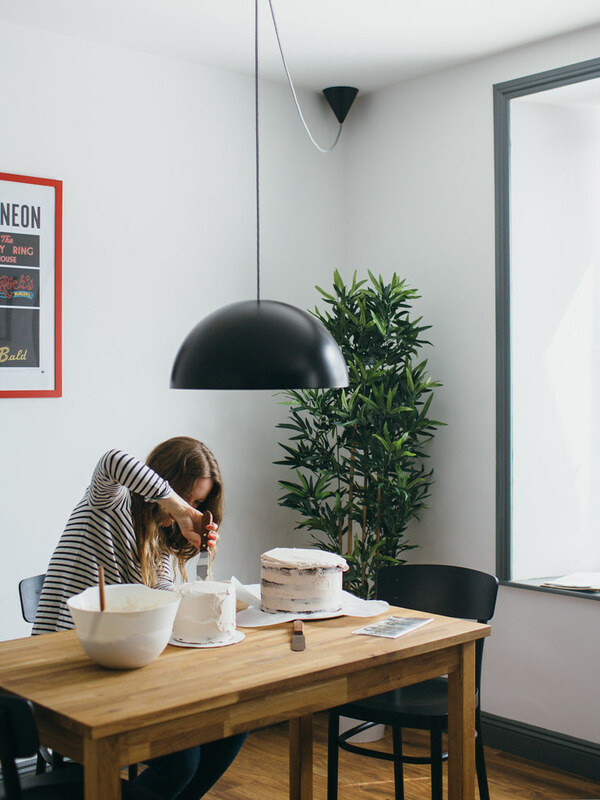 Transfer the frosted cake to refrigerator to chill (so that the ganache doesn't melt the room temperature frosting). Prepare the ganache by adding the chocolate to a small mixing bowl; set aside. In a small saucepan over medium heat, bring the milk to a boil then pour it over the chocolate. Let stand for 4-5 minutes, then whisk until smooth. Stir in the whiskey and set aside to cool for about 10 minutes. 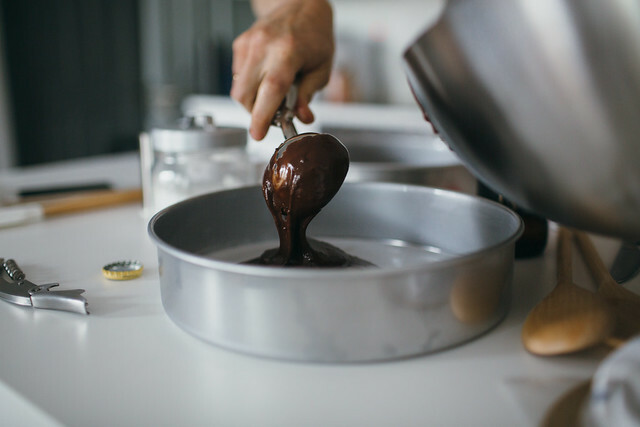 Once the ganache has cooled, pour it over the cake, smoothing with an offset spatula to ensure you get little drips down the side. Let it set for about 20 minutes before topping the cake with truffles. 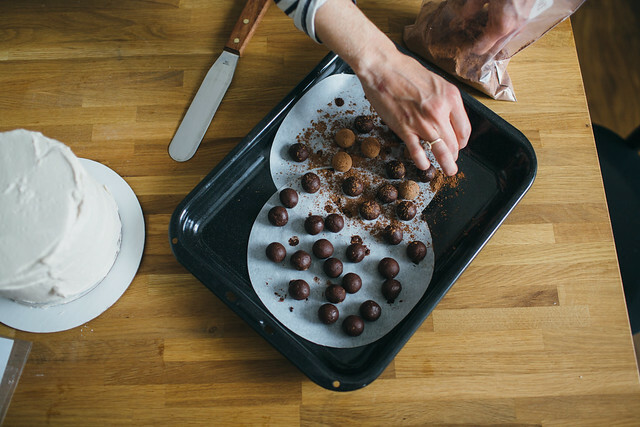 Line the bottom of the cake with halved truffles (whole truffles are way too bulky) or chopped up chocolate. Cake will keep for up to three days. If you don't plan on cutting into it within the first 24 hours, loosely cover it with plastic wrap.